Disco frustration – HubNut – celebrating the average! No, this isn’t a post about failing to be like John Travolta, nor about discovering that my Discovery is a heap of rubbish. No, the frustration stems from the fact that I dare not drive it! However, I would also like to officially relaunch Project Budget 4×4 – my attempts to prove that 4x4s need not be expensive to buy and own. If the pistons come up and smash into the valves, there’s going to be damage. It varies from engine to engine, but there’s a very good chance that a large number of valves will be bent and therefore useless, and you might have damage to the cylinder head as well. So, it needs replacing – and pretty darned soon. There is also a requirement for tools I don’t own, and when you start adding up the price of things, farming the job out starts looking more sensible. 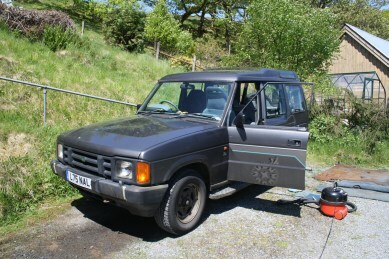 Sadly I must wait for parts to arrive, so that leaves me with a Discovery I can’t drive. Not that I can’t meddle with it – the sun is shining, it’s on my driveway and the to do list is sizeable. 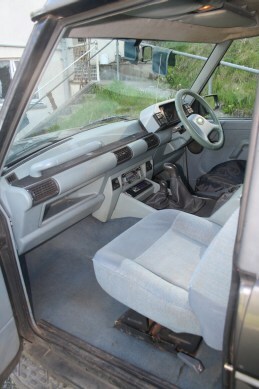 The first job was to clean up the interior. It was disgusting as the car had been used to ferry children, dogs and horse paraphernalia about the place. Scrubbing the seats, plastics and carpets with soapy water has improved things greatly, as has a session with Henry the vacuum cleaner. 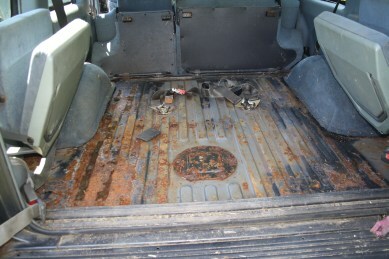 I then started getting a bit carried away and pulled out the rear carpet to find this. Amazingly, there is metal there. It looks worse than it is really, thanks to bits of icky, rust-soaked foam. I scrubbed it down and gave it a coat of Rustoleum, so it looks alright now. The bigger problem is what to do with the boot floor. It was pretty wet, thanks to leaks from the rear alpine lights (at the sides of the roof) and possibly the rearmost side windows. There’s no point putting the mat back as it’ll just start trapping moisture again. Perhaps I’ll just leave it. I also fiddled with the rear wiper, so it actually now clears the window – a bent arm and too-long wiper blade being the issues there. It’s all unimportant stuff really, but makes me feel better and gives me a chance to get a feel for the car. After all, I bought it, then disappeared off to a music festival for five days, so I’ve barely seen it since I got it home! As you can see – my efforts have not been in vain. The interior has come along brilliantly. There is some damage to the driver’s seat, so I’ll leave the cover on it for now. The two front seats seem to have a bit of play in them too – they tilt forward in an unusual manner to allow access to the rear seat. An advisory on the most recently MOT. 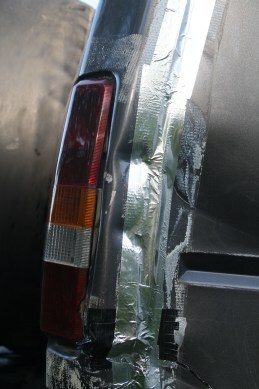 I also inspected the damaged rear quarter more closely. I pulled off the gaffer tape and found some nasty damage. There’s nothing I can do about it so I set about covering it up with a combination of black gaffer tape and aluminium tape – which at least looks much nicer than the blue gaffer tape previously used! Ideally, it needs an entire rear side, but I can’t see that happening. The gaffer tape smooths over the sharp edges, and the aluminium tape hides a panel gap you can get your hand in! Attempts to investigate a braking issue – it pulls to one side on heavy braking – were frustrated by the fact that I can’t find a suitable socket for the wheel nuts. I must own one as I managed to remove the Range Rover’s wheels. I wonder where it is?